The main focus of the week for Wesham Road Runners was their annual 10k road race on Saturday morning, which attracted not only arecord entry but a record number of finishers. It also marked another win for Rob Danson who crossed the finish line in 32:23. 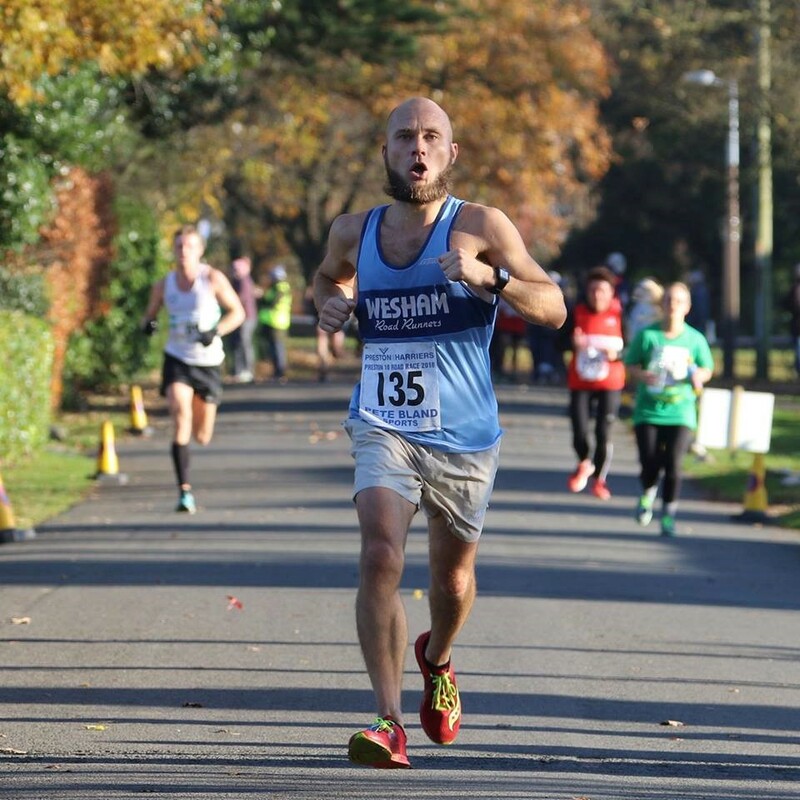 Not a record for him this time but he headed a stellar Wesham team, with Gareth Booth 2nd in 34:28and the M45 win, followed up by Ugis Datavs in 5th place with a time of 36:11; David Taylor 11th in 37:18 and Lee Barlow 12th with 37:27 finishing 3rd M45, adequately securing the senior men team win. The leading woman in the race was Jill Jefferson of Red Rose in 42:19, a W60 with one of the best performances in UK history. Wesham’s first finisher was Emma Lund in 8th position with 45:53, 106th overall and 1st W35. Helen Lawrenson was 9th in 45:58 in 108th place and placing 4th W45. Suzanne Leonard was 16th and 5th W45 in 48:36, 148th overall. There were 60 Wesham runners in the race, with Paul Gregory finishing 1st M40 and 15th overall in 37:40; World Ironman Ian Garrod 2nd M55 in 41:01, 41stoverall; Peter Cruse 3rd M55 with 41:02, 42nd; Nigel Shepherd 2nd behind only Paul Muller in 42:14, 56th. Alan Hudson was 3rd M65 in 47:40, 134th; and Dave Young 3rd M70 with 54:18, 265th overall. 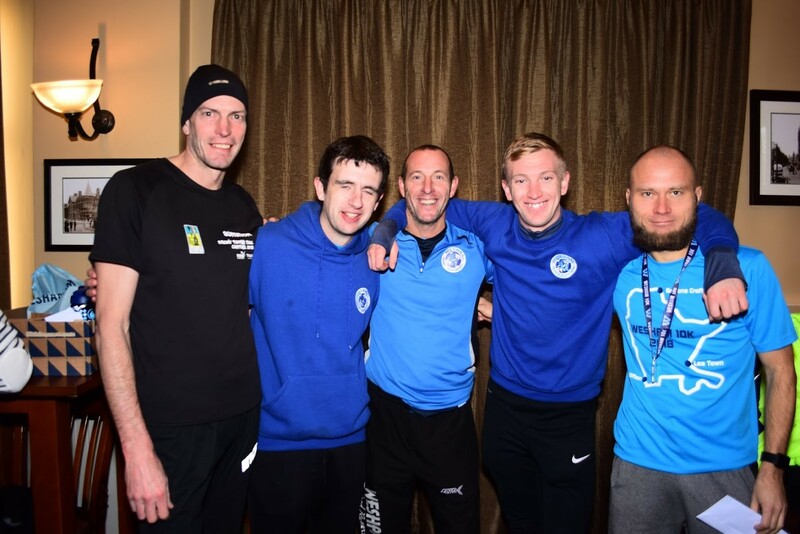 Andrew Harling was 17th in 38:34; Thomas Crabtree in 27th in 39:58; Mark Renshall 28th in 40:00; Jason Barlow 34th with 40:23; Chris Hastwell 35th in 40:33; Steve Myerscough 62nd with 42:48; Paul Lancashire 65th in 43:06; Elliot Costello 67th in 43:19; Stuart Clayton 71st with 43:40, 7th M50; Graeme Taylor 72nd in 43:43; Neil Whipp 76th in 43:57; Rob Wallace 44:18; Jonathon Sanderson 93rd in 44:49; Stephen Browne 127th with 47:13; George Kennedy 148th in 48:36; Dave Marsland 163rd and 8th M60 in 49:16; Martin Allison 164th in 49:17; Ryan Azzopardi 189th with 50:44; Mark Dobson 191st in 50:49; StephenTwist 194th in 50:55; James Danson 211th in 51:39; Finlay McCalman 215th in 51:55; Maureen Danson 49th woman and 6th W50 in 53:17, 240th overall; Elizabeth Johnson 53rd woman, 246th in 53:27; Peter Cooke and Russell Mabbett, 251st and 252nd with 53:40 and 53:41; Catherine Nicholls 59th woman and 258th in 53:56; Chris Pike 260th in 54:01; Paul Carter 273rd in 54:36; Pauline Eccleston 68th woman and 283rd in 55:10; Tanya Shaw 73rd and 290th with 55:33; Martyn Taylor 292nd in 55:41; Tanya Barlow 74thand 293rd in 55:42; Stuart Topping 294th in 55:42; Jo McCaffery 84th and 311th with 57:14; Antionette Holton 91st and 323rd in 57:49; Heather Buckel 96th and 330th in 58:16; Lucy Neighbour 110th and 351st with 59:04;James Birchall 360th in 59:45; Sharlan Butcher 117th and361st with 59:51; Clare Belfield 124th and 371st in 60:47; Emma Wright 125th and 372nd in 60:54; Sally Deacon 126th and 373rd in 61:04; Nicola Ball 132nd and 381st in 41:47; Julie Rooney 146th and 401st with 63:15; and Joy Hetherington 117th and 439th in 67:41. The second round of the Mid Lancs cross Country took place in Liverpool’s Sefton Park on Saturday afternoon, incorporated in the UK Athletics Cross Challenge,the third event in this series. It is used as the selection for the GB team for the European Cross-Country Championships, so it is guaranteed the highest standard with athletes from all over the country taking part. The action for Wesham started at 13:05 with the Senior Women’s race incorporating the Mid-Lancs Over-70s on an 8.1 mile two-lap course with a short opening lap. Wesham had just one woman running, Kath Hoyer, who finished 9th W55 and 99th overall, placing 225th in the main ladies’ race. In the M70s category Dave Young finished 3rd M70 (143rd in the Mid Lancs field and 277th in the main race) with a time of 45:43. overall. Dave Waywell was 4th (149th and 283rd) in 46:16. Together they won the M70 team in the Mid-Lancs. 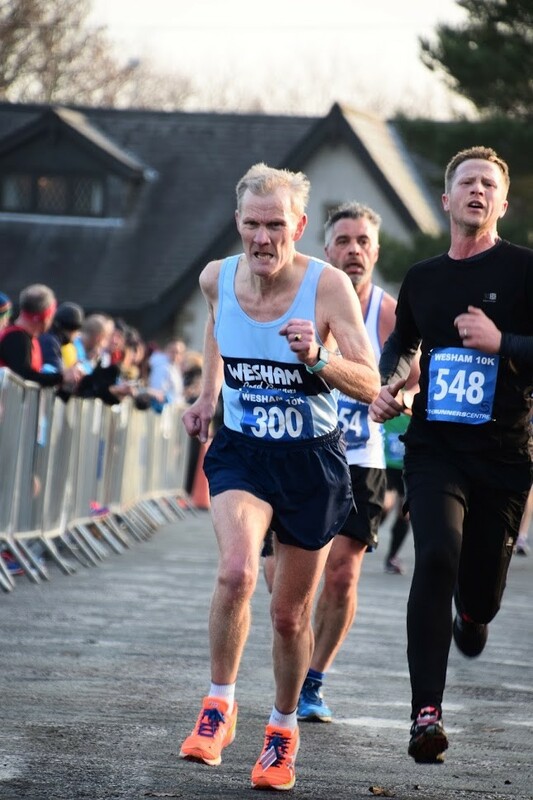 In the Senior Men’s 9.8km 3-lap course Mark Belfield was the first Wesham finisher in 126th place with a time of 37:53, placing 308th overall, a good position in such a high-quality field. Phil Quibell was 6th M60 in 38:50, 150th in the Mid Lancs and 342nd in themain race. John Collier was 7th M60 and 229th in 42:15, finishing 460th overall, and Ben Wrigley was 291st (561st)with 47:17. Russell Mabbett finished 61st M50 and 314th in 51:47, 601st overall. The men didn’t finish a senior nor an M40 team but were placed 9th in the M50 stakes. SteveLittler was in Benidorm and ran the 10k there 34:39 to finish 8thoverall and 1st M45 and 1st Brit in a field spattered with GB runners. Carmel Sullivan finished 1st W50 and 95th in 42:57, andMick Edge managed a creditable 48:44 for 17th M55 and 241st overall. Martin Bates is also sunning himself and taking part in the annual Lanzarote Challenge, based at the Club Lasanta training facility. So far he has completed the 10K on Sunday in 50:46; the Ridge 13K trail race on Monday in1:17:04; Beach 5K on Tuesday in 25:00; and 21K (metric half-marathon) on Wednesday in 1:53:02. Tessa Robinson not only ran the fastest woman’s time at the Lytham Hall Parkrun on Saturday morning but the fastest overall as she steamed round the 2-lap course in 18:59 for a W35 age graded performance score of 80.07%. Numbers were noticeably down due to the imminent Wesham 10k and the Mid-LancsCross Country League in Liverpool in the afternoon. Jonathan Lawson ran 21:44 for an M50 age graded performance of 68.40%. Tracey Hulme ran the south Manchester Parkrun in Platt Fields in 23:41 for W55 76.43%. John Burns ran the Preston run and he clocked 22:52 for M60 72.01%. Robert Brown clocked 25:45 with his M60 grade of 72.01%, and Vicky Gore 27:25 for W40 56.53%. Graham Brook ran Fleetwood Promenade and he ran 28:42 in his debut at the venue for M50 52.21%.